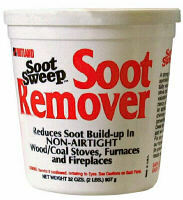 Soot Sweep Soot Remover for free-burning stoves. This is a combustion catalyst for fireplaces, and non air-tight stoves. Soot Sweep powder helps get more heat from wood while reducing dangerous soot and creosote build-up. This product does not contain any corrosive rock salt like lesser products. Makes chimney cleaning easier and reduces chimney fire danger.